In the summer of 1999, Nicolas Anelka transferred to Real Madrid for a £22.3 million transfer fee from Arsenal. He became the most expensive player in the history of Spanish football, signing a monstrous £35,000 a week contract. He called it "an insult to society". Javier Clemente, the former Spain national team manager, blasted the move. "To throw seven billion pesetas out of the window when you could do so many other things... With that much money I could feed all the hungry people in Madrid." Anelka failed to score for Real Madrid in his first five months at the club, was suspended by the club president in March 2000, and was promptly sold to PSG for the eerily similar fee of £22 million. That's the same PSG who sold Anelka to Arsenal for half a million pounds. The transfer market was blown open. There is something sad about the transfer fees being brandied about today - simply because people don't realize who is really paying, and who the money goes to. Yes, the selling club does get more money, but finds that any replacements they're interested in are more expensive. And yes, the player does get more money, but finds themselves staggering under expectation. It's the agent who is always content, pocketing a commission and looking for the next big move. Worse, it's the fans who end up paying the money. The fans end up forking out even more for the privilege of watching the new signing fail to bed in properly with his new team-mates. We're the losers at the end. We're the losers because flashy signings distract from the fact that this is an unregulated market. We're the losers because that money could be better used. We live in a society where 400,000 people had their benefits sanctioned in the UK in 2015, which saved1 the UK government £132m a year. The brutal cuts which make hundreds of thousands of lives a misery cost just as much as Manchester City's net spend that summer (£131.2m). We live in a society where at least 95 families were evicted every day in Spain in 2014 and yet the previous summer Real Madrid spent €101m on just one player2. 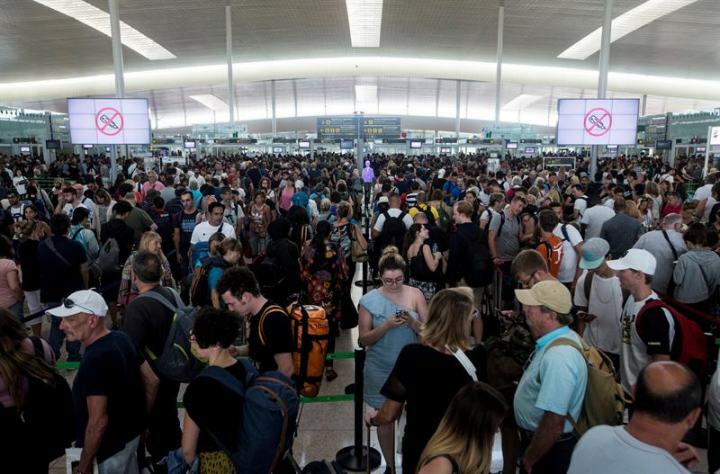 We live in a society where Barcelona's El Prat airport has security staff who have to strike to make their voices heard, who have to work overtime due to under-staffing and a basic monthly salary of €900-€1,100 (£812–£990). Just three weeks later, a football club in the same city delved into a market where a 20-year-old who has played two top-flight seasons in his career3 can cost €105m - and that is considered normal. Passengers gather as they wait for passing the security controls at Barcelona's El Prat airport due to the strike of security agents. We live in a society where Italy's unemployment rate in July 2016 was a staggering 11.5% and in the same month a 28-year-old striker4 cost Juventus €90m. It really is an insult to society. 1 Maybe not - a shocking report by the National Audit Office actually found that while benefit sanctions saved just £132m a year, they cost £285m a year to run. Go figure. 4 Gonzalo Higuaín. He is still the most expensive South American footballer of all time; his transfer fee was the highest ever paid by an Italian team and also the highest of a player transferring within any domestic league.